I stink of meat. Two hours in a Chinese hotpot restaurant - like sitting in a porky sauna. And I would do it again in a heartbeat. I’d first heard about Little Lamb from Alex Carnegie who’d actually been on a quest for shabu shabu but settled for a close cousin. Then bellaphon paid a visit to the place and I knew I had to check it out myself. A couple of days later, I’m drifting around town waiting for my husband to meet me after work when I find that I’m at the top of Shaftesbury Avenue which is where Little Lamb lives. 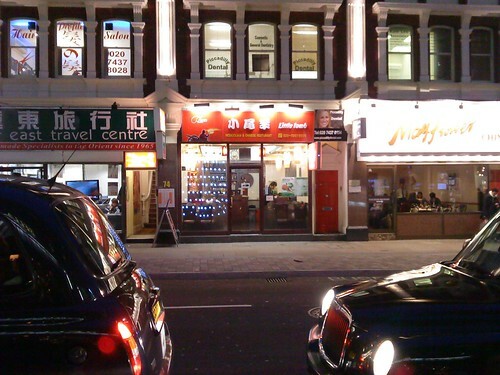 I ring the hubby and say “Oi, we’re going for Chinese Hotpot, meet me in front of Curzon Soho asap”. I locate Little Lamb, ask for a table for two in twenty minutes and then wander into Golden Gate Grocers and randomly buy some ngò gai aka sawtooth herb and the tiniest pink Thai shallots in excitement. The lady at the till waves the sawtooth at me and says something in Chinese. I apologise and say me no comprende and she says slowly “You. can’t. cook”. I’m bemused for a moment, but then decide it’s not a damning indictment of my culinary ability and simply an instruction re the herb. Hubby arrives and we walk into Little Lamb to be shown to the basement where we’re hit by an intense, spicy smell. We sit in the corner and the waitress brings us a tick menu - for a mere £20 a head, we can pick 5 raw items each, as well as a soup base. So incredibly cheap, it's no wonder a huge group of salarymen is already in residence, ordering plate after plate of pork. We go for a base of twin flavours of herbal tonic and spicy as recommended by bellaphon and then I spend an eternity wondering how to allocate the rest of my ticks (the husband has no say). Eventually I tick beef, 2 x pork, 2 x prawn in shell, crab, needle mushrooms, pea shoots, fresh tofu. And then I have a panic as I worry about all the ones I haven’t ticked like the lamb and the fishballs and the squid. There’s one space left, but I feel like we need a carb, so we choose soft noodles (whilst I silently weep that rice noodles are not an option). And then we wait. And we wait. I stare at a picture above an alcove which from a distance appears to be Mother Theresa. The waitress is beleaguered - she alone is dealing with the room which is filling up so I don’t really mind - but then she takes an order from a table that arrived way after us so I go into a mini strop (at my husband, not at her). Finally we grab her attention and give her our sheet and ask for a coke and an orange juice. No frills here - the coke is a can with a straw stuck in it, but at least the OJ isn’t Caprisun. Soon the waitress returns with a split cauldron of soup - one side Hadean red, the other a pale consomme. She places the pot on the hotplate and switches it on. We stare as unidentifiable objects bob up and down first gently then quite friskily as the stock heats up. For some reason, the spicy side is much, much more violent than the herbal - appropriate for something that looks like the very depths of hell but there must be science behind this phenomenon. Meanwhile a table of four has sat down next to us, two men and two women. They don’t appear to like each other. I’m not convinced they even know each other. More on them anon. Next the waitress brings the good stuff. The portions are immense - even I’m a bit daunted. 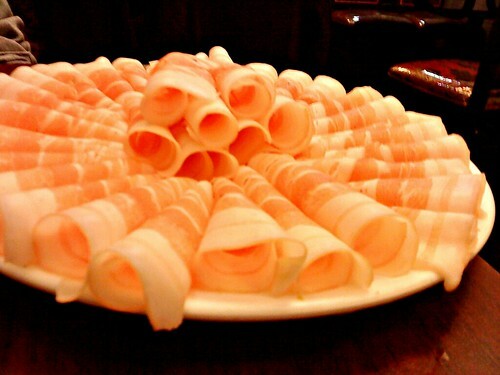 Presentation is a strong point - the beef slices are fanned beautifully, the pork slices rolled artfully. The prawns are huge beasties - at least eight per portion - so there’s sixteen of them boggling their big, black eyes at me. The crab plate makes me squeal with happiness - there’s four soft-shell blue crabs bisected for ease of access. There’s a big bunch of peashoots, a wodge of enoki and lots of fat, wobbly tofu. Joy! 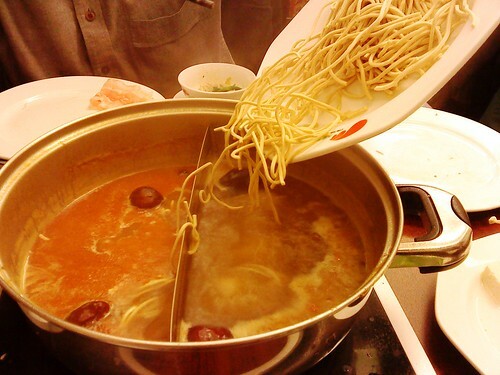 We grab our weapons (chopsticks, drainy ladles) and prepare to do battle with the bubbling broth. In goes some pork … and promptly vanishes, engulfed by the thrashing, soupy waves. “Erm, we should probably turn it down a bit” I say to my husband and he obliges (the control is on his side). My meaty rescue mission is a success and the pork, and the beef which follows, is a dream - the slices are meltingly tender, marbled with fat, wafer-thin as shabu-shabu. I am in heaven. Our neighbours are now making their choices. The man nearest my husband is openly watching us eat and making me feel self-conscious. One of their group hisses “I want what they’ve got”. All four of them eyeball us. I try to ignore the voyeurs and get on with sending the prawns to their watery fate. Swish swish - we cook one titbit after another. It’s hard to resist claiming our prizes too soon and husband and I scald our tongues repeatedly. The voyeurs receive their own bounty. They’ve chosen the same split soup as us. One of the girls has a spoonful and immediately yelps “Oh, that’s far too spicy. I do not like that. Don’t eat that, everyone”. The others say why ever not and pay her no heed. I look sideways at her - early 20s, Shirley Temple hair, Veruca Salt attitude. The man next to Veruca (her father it seems) is still staring at us longingly. We continue our onslaught. Each time the stock bubbles worryingly low, the waitress returns with a kettle to top it up. 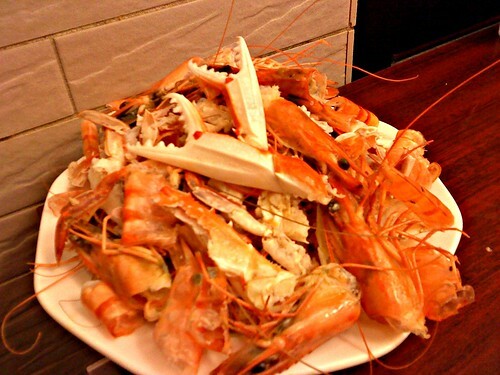 The chitinous mountain next to me is testament to my seafood extraction skills. Alas, my crabby stylings are constantly interrupted by Veruca Salt spamming my ears with “I can still feel my mouth burning. I really don't like it” over and over, plus one whine of "Ours doesn't look as good as theirs". Suddenly, the other girl snaps and says “If you don’t like it, why don’t you leave?”. I sneak a peek - Veruca’s bottom lip wobbles, she gets her coat, says “I never wanted to come here anyway” and actually storms off with her little rucksack on her back. Fan-bloody-tastic - I admire the girl’s balls. Veruca’s father sighs and says “I knew this would happen”. The other voyeurs just grimly continue to eat - not one of them makes a move to chase after her. Finally some peace, but we’re almost done anyway - the soup has reduced to a lovely savoury stock full of the goodness of everything we’ve chucked in it. Husband throws the noodles in to soak up the loveliness. We let them simmer softly and I cackle at all the debris around us. As we wait for the noodles to cook, Veruca abruptly reappears with an embarrassed look. I’m so very disappointed - if you’re going to flounce off, you should stick to your guns - it's ruined the glory of her dramatic exit. The other girl says “Come on and sit down” and Veruca does, but not before pouting “I’m not coming here again, though”. Veruca’s father asks what made her come back and she says “He [pointing to the other male] sent me a text message”. Her father sighs and says “I wish you’d listen to me the way you listen to him". Order is restored and the voyeurs continue their meal quietly, until the other two start to bicker about whose job is more "customer-oriented". Hubby and I are finally finished though - we push our chairs back in triumph as we've conquered the broth and there's nowt left save the odd prawny feeler. It's not till we get home that we realise that every single item of clothing we're wearing smells porkalicious. We stink of meat. Oof blimey that is a lot for £20 a head, I like the look of this place! But tell me have you had any recurring dreams where a little chinese lady peers at you through a cloud of smoke and says "You. can't. cook"
I have a big appetite - especially for meat - but that does seem like a whole menagerie of dauntingly large dishes. The problem is with that sort of food is that it's like crack cocaine or pringles: once you start, there's no stopping as you descend into some sort of meaty Armageddon. It all looks and sounds - Veruca aside - fab and I am feeling a teensy-weensy bit of meat-envy. Veruca et al- hilarious! Smelling of meat, consider yourself lucky that you didn't tick tripe! Thanks for the mention and glad you enjoyed it. @Foodurchin - Maybe we should swap our Chilli Cool trip for Little Lamb - it's so much fun! @Fat Les - Thank you Les for showing me the light! @meemalee - i once ordered a whole large half shoulder of lamb at a pub and the entire table watched in horrified fascination as ate the entire thing. That was my meaty Armageddon. And then I ate dessert. Even I was was disgusted at myself - in a proud kind of way. Fab write up! Do you think the soup base was meaty too? I quite like the idea of this with lots of seafood and veg, and would be happy to put up with wearing meat perfume for a while if that was the case! @The Grubworm - Wow. You are meat king. @TheFastestIndian - I don't think the base was meaty in itself, but there are about six different types so at least one of them must be meat-free. 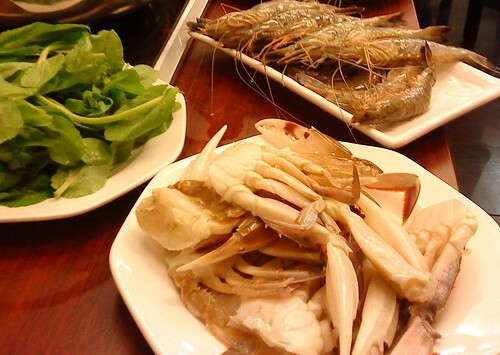 Re the crabs - though they were soft-shell (as far as I could tell), you couldn't eat the actual shell, but you could chew on it and get all the meat out very easily with just teeth and fingers. Great post - exactly what blogging's about! ! 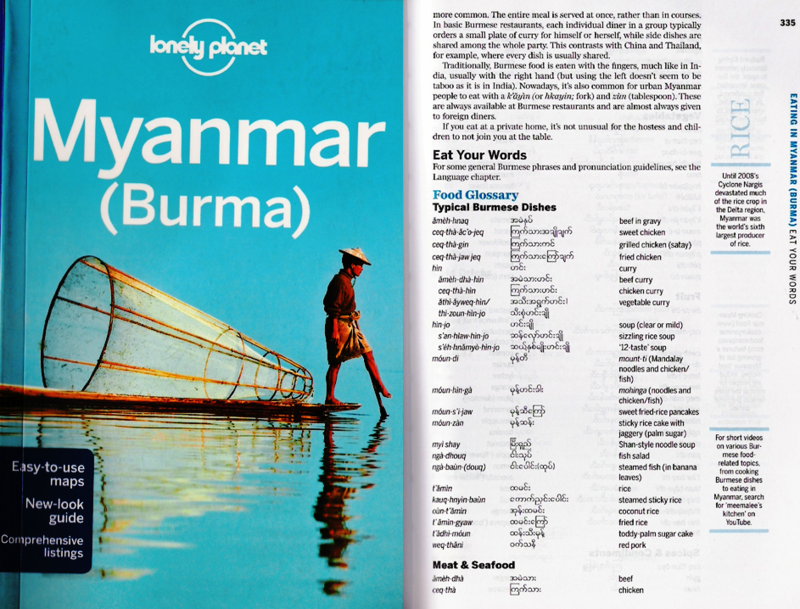 shall be heading that way very soon! This is the BEST tip ever. I love places like this - and who knew it was there?? I must have walked past it so many times. I know where I'll be this weekend! Hope I witness even 1/2 the drama you did! Cor, what a cracking meal. Lovely write up MiMi. You make it so interesting. A joy to read. 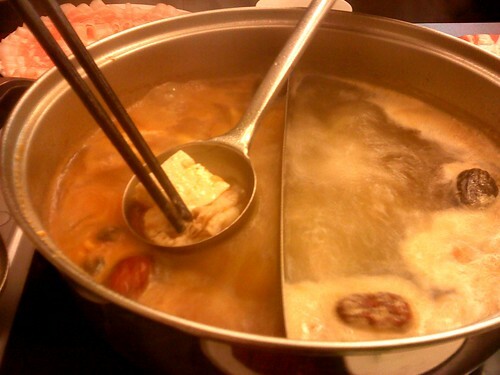 I badly badly want to go - I used to love steamboat meals when I was a kid - a sign of my future love of cooking, perhaps? Great write-up - that Veruca would have driven me bonkers. Brilliant stuff again (but don't think I didn't notice that you'd slipped a "hubby" in there ;-) ); it's not just your enthusiasm, but also your wit and choice of words that makes your reviews so good. The food looks brilliant and amazing value. 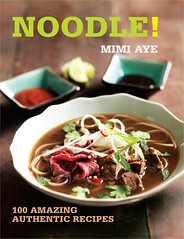 And don't think, MiMi, that we regular readers have forgotten your Burmese cookbook! @Greedy Diva - It's true, Soho girl - go to it! @Lizzie - Steamboat is awesome - I have friends who make it at home but that's too much faff for me. MiMi this looks amazing! I am so freaking jealous I want to try this fo sho! 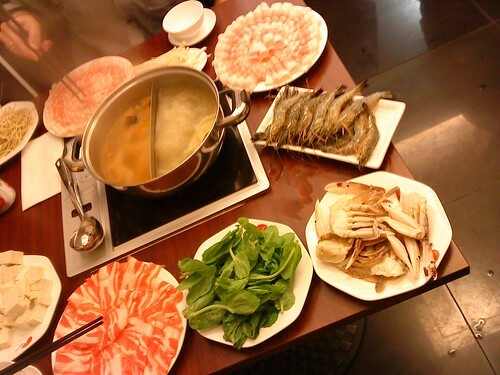 @Paul - I've been trying to find steamboat places for you in Leeds - Crown Buffet sounds like it might be ok .
Glad you liked it! Definitely going to have to pop in again myself at some point. There's something really nice about sitting around a big bubbling pot, especially this time of year. LOL @ "You can't cook" - it would be amazing if they let you bring in your own stuff though. Great writeup, and that I wholeheartedly agree with. Loved the description of your neighbours' drama too! 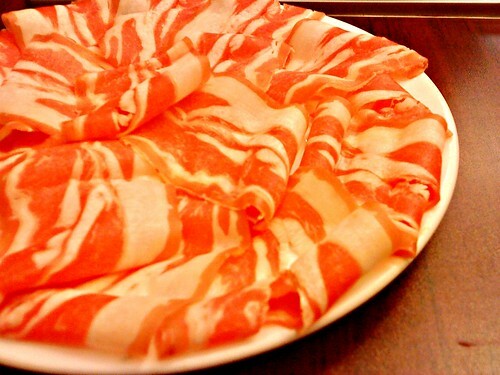 Shabu shabu - god how I miss shabu shabu.....I've heard of little lamb, but have never been. Must rectify this asap, smelly or not. @Alex - You are a trendsetter :) It did occur to me that I appeared to be buying ingredients for a hotpot - BYO would be brilliant! @Niamh - Cheap as chips! And who doesn't love Willy Wonka (I am not taling about the Tim Burton travesty)? 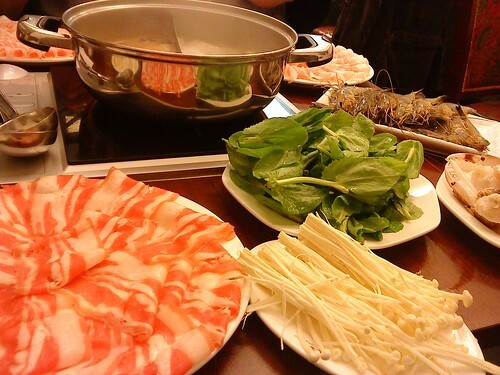 @gastrogeek - I've still only had shabu shabu once (in Osaka). It were grand. I'm just impressed that you managed to take so many photos. I kinda gave up when the food started coming thick and fast. @Mr Noodles - Just about managed it - and with my phone too as I didn't have my camera! Stumbled across your blog via Krista's. Have gone back & read all the archived reviews over the past couple of months. I do so enjoy your writing style! Looking forward to trying this place out. We're going to Little Lamb again in a fortnight - can't stay away! Steamboat AND a floor show - excellent! I love people watching while I eat. @Foodycat - Haha, sometimes people beg to be watched!